This appears in English as "You can't ride on two horses with one arse." This idiom appears at the top of today's daf, Bava Basra 152. 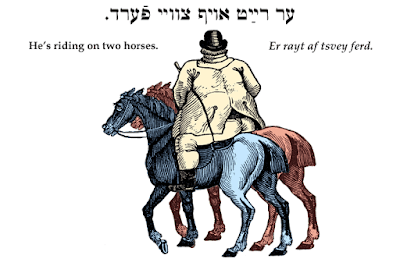 "The academy of Rav said in the name of Rav, you are causing him to ride on two steeds / saddles." The setama degemara proceeds to interpret this as a positive thing, giving the transaction some of the force of a shechiv mera and some of the force of the kinyan of a healthy person. This is problematic, because it contradicts an explicit statement of Rav elsewhere, that it will not work because a kinyan is the opposite of matnat shechiv mera. But the gemara manages to harmonize it. Given that it is an idiom, and it is easy to misinterpret an idiom without direct knowledge of its usage, perhaps we can suggest that the setama degemara misunderstood the idiom. (Yes, they are closer in time and place, so maybe we are misunderstanding it, but on the other hand, we have the other statement of Rav.) If its intent is indeed the same as the Yiddish expression, and the same as the later posekim, then the is the same as Rav's position elsewhere, and the contradiction was never a contradiction, but was rather explicit agreement.